Nationality: American. Born: Luton, Bedfordshire, England, 25 August, 1939; son of English actress Mary Hewitt; moved to U.S., 1945; grew up in Alabama, stepson of U.S. Army colonel. Education: Attended Indian Springs School, Alabama; B.A. in philosophy, Yale University, 1961; M.A., Yale School of Drama, 1963. Military Service: U.S. Army, 1963–64. Family: Married Bonnie Sue Hughes, 28 December 1967 (divorced 1979), daughter: Kelly MacDonald; married Jan Speck, 1983 (divorced 1990); married Olivia Laughlin, 1992. Career: Worked in various jobs for Hollywood studios, including mailroom assistant at Universal; assistant director to Steven Spielberg on Night Gallery (TV series), 1969; associate producer at Universal Studios, 1969–70; solo film directing debut, 1971; worked exclusively in TV as director until 1976; most successful period was as maker of action films and thrillers in the 1980s; guest lecturer at Yale University, UCLA, University of Southern California, Amherst College; Chairman of Yale Drama Alumni Fund. Awards: Southern California Motion Picture Council Award for The Gun , 1974; Grand Prize, Ninth International Science Fiction Festival of Paris, Best Horror Film Award, and George Pal Memorial Award, Academy of Science Fiction, Fantasy and Horror Films, all for Dracula , 1979. Agent: Adams, Ray & Rosenberg, 9200 Sunset Boulevard, Los Angeles 90069, USA. Brown, Jeffrey A. "Gender and the Action Heroine: Hardbodies and the Point of No Return ," in Cinema Journal (Austin, Texas), Spring 1996. Quinlan, David, "John Badham," in Quinlan's Film Directors , London, 1999. Vincendeau, Ginette, "Highjacked," in Sight and Sound (London), July 1993. Wood, Robin, "Burying the Undead: The Use and Obsolescence of Count Dracula," in Mosaic: A Journal for the Interdisciplinary Study of Literature (Winnipeg, Manitoba), Winter-Spring, 1983. 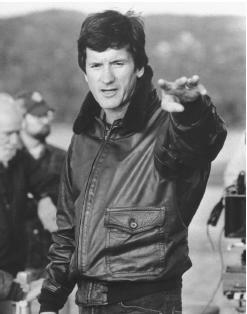 John Badham: The Director's Director , 1982. Best known as the director of Saturday Night Fever , and a raft of flawed but popular thrillers, English-born director John Badham began his career working in television on series such as Night Gallery (1969), Nichols (1971) and Police Story (1973). He also made several TV movies of variable quality in the early 1970s before going on to establish the characteristic glossy style of his 1980s film output. Badham is notable for the number of different types of films he has made, from dance drama in Saturday Night Fever through romantic horror in Dracula , techno-paranoia in War Games , and sub-Hitchcockian thrillers such as Bird on a Wire. Badham is a workmanlike director, skilled in the mechanics of movie making and with a reputation for making reliable, if sometimes predictable, entertainment. The disco dance movie Saturday Night Fever accelerated the career of actor John Travolta, and also marked the beginning of Badham's own most successful spell as a director. The dramatic pace of the film, helped along by some sharp editing and Travolta's presence, have made Saturday Night Fever a cult movie: Travolta's dance scene in Quentin Tarantino's celebrated Pulp Fiction (1994) pays homage to the earlier film. Yet despite its cult status Saturday Night Fever is at times a rather sluggish film, rescued only by Travolta's performance and some extraordinary dance sequences. It has been released in several versions over the years, some of which are quite heavily censored. After the success of Saturday Night Fever , Dracula became Badham's stylish contribution to the vampire film canon. An expensive production, heavy with visual effects and flamboyant theatricality, Dracula gives an indication of Badham's status in Hollywood at the end of the 1970s, and is one of his most watchable films. His period of greatest success, however, came during the 1980s, when films like Blue Thunder and War Games appealed to Cold War worries about placing too much faith in technology. Blue Thunder is a lavish action movie featuring a plot about the commissioning of a high-tech police helicopter. More interesting is War Games , which was Oscar nominated for screenplay and cinematography. An early treatment of the dangerous possibilities for online terrorism, War Games tells the story of a teenage hacker who manages to connect his home computer into the Pentagon's system, pretending to be the Soviet military about to embark on nuclear war. At a time of great tension between the West and the Soviet Union, the film was a reminder that deadly conflicts often begin with a misunderstanding. Playing on the mystique and suspicion that still surrounded computers at the time, War Games is overburdened by the need to make the machines look as complicated and sinister as possible. It could be argued that the elements of adventure and suspense in the film contradict the message that hacking poses a serious threat. Nevertheless, both Blue Thunder and War Games were immensely successful at the box office. Short Circuit again demonstrated Badham's ability to switch between genres, this time with the enjoyable comic story of a malfunctioning robot on the loose. It was quickly followed by the lighthearted but over-long police thriller, Stakeout. After these successes, Badham's career took a downturn in the late 1980s from which it has never really recovered. Bird on a Wire is an amusing but ultimately unbelievable star vehicle for Mel Gibson and Goldie Hawn, while another comedy thriller, The Hard Way , tells the story of an actor who teams up with a real-life New York cop in order to research a film role. Badham's later films can mostly be described as journeyman work, epitomized by Point of No Return ( The Assassin ), a remake of Luc Besson's La Femme Nikita. Besson's film is a gritty, violent movie about a convicted killer given the chance to avoid the death penalty if she agrees to work as an assassin for the state. While the Badham film sticks fairly closely to the plot of the original, it takes a sanitized, altogether softer approach. There seems little reason for Point of No Return ever to have been made, other than the American audience's dislike of subtitling and Hollywood's worries about the extreme levels of violence in the French original. Having begun his career in television, Badham has returned at the end of the 1990s to making TV movies. While in filmmaking terms many of his films are uneven and unsatisfactory, in the 1980s he made some of the most popular movies of the decade. He has also been involved in the development of computer generated special effects. Ironically, having established a reputation as a director of predictable star vehicles, he will probably be best remembered as the director of Saturday Night Fever , a film which helped make a star of John Travolta.